First things first, DO NOT VOTE STRAIGHT PARTY! I cannot stress this enough. Voting straight party means that many races you could be voting in and have a big impact in will be skipped. If you are voting straight party, and there is not a candidate of that party in some race on the ballot, then you are not casting a vote in that race. There are many qualified candidates who are independent, or are of a party you are ambivalent to that you could be supporting. Do you really want a candidate of a party you hate to win a high profile race simply because you decided to vote straight party and not to vote for their opponent? Secondly, No one owns your vote but you. No candidate owns it. No other voters own it. It is yours and yours alone to freely give to whomever you wish. You are also absolutely free to withhold your vote in any race. You are not required to vote in any way. So in a sense, this second point counters my first point. So feel free to ignore me telling you not to vote straight party. But if that is your wish, I do ask you to at least look at your sample ballot and decide for yourself if those races that do not have a candidate of the party you support do have a candidate you could get behind. Now for the simple task of putting forward my endorsements for all statewide and congressional races. For Governor, I am endorsing Libertarian Chris Powell. Of the three candidates, he actually supports full criminal justice reform and marijuana legalization for both medical and recreational use. Stitt says he supports the will of the people on medical, but he has expressed interest in blocking its growth. Edmondson was the state AG and used his position to expand the over-criminalization in Oklahoma leading to the problems we are facing right now. We cannot trust him to fix the mess he had a hand in creating. Neither Stitt nor Edmondson will reduce the size and scope of government in Oklahoma. Powell will. Powell has also stated clearly that he support ballot access reform, easing of the initiative process, and other changes to election laws to make it easier for you to vote, or run for office. For Lt. Governor, we are not given a lot to go on here. In general, I think the office of Lt. Governor is a pointless office and should be gotten rid of. But since we have a race for it, here we go. I checked out the Independent Candidate, Ivan Holmes, but he has no real information to share. One wonders why he is even in the race. As for the Republican candidate, Matt Pinnell, and the Democratic candidate Anastasia Pittman I really have no opinion. Since the Lt Governor in Oklahoma has so little power and basically nothing to do (seriously, when was the last time the Lt Governor had to cast a tie-breaking vote in the Senate? ), I am simply inclined to cast an endorsement for Anastasia Pittman for no other reason than having a woman of color in that office is preferable. Libertarian candidate John Yeutter is the only choice for State Auditor and Inspector. His only opponent is Cindy Byrd, Republican. Both are licensed CPAs. But John is also a professor of accounting and is a member of the only political party that will actually do something about the rising cost of government services and tackle wasteful spending throughout the state. Attorney General is actually pretty easy. After carefully reading and considering their positions, Democrat Mark Myles wins out over Republican Mike Hunter. Unfortunately, both are pro-death penalty, but that is about where their similarities end. I don’t like everything about Myles’ platform, but he at least recognizes the issues that our over-criminalization has had on the State and plans to do something about it. He recognizes that our criminal “justice” system disproportionately harms people of color and the poor among us and wants to fix that. Hunter on the other hand is simply dumb on crime and wants to keep on forcing Oklahoma down the exact same path it has been on. Who knows what is happening with the State Treasurer‘s race. Republican Randy McDaniel doesn’t even have a website I can find. He is a sitting legislator and seems to be using this to advance his political career. Independent Charles de Coune does have a website but doesn’t have a whole lot of information there. What little I can find, he seems to be the better choice over the establishment Republican looking to advance his political career. For Superintendent, it is easy to rule out Joy Hoffmeister. She really hasn’t done anything of note during her current tenure. Both Democrat John Cox and Independent Larry Huff have teaching experience and a background in education. I am inclined to support Larry Huff in this race for no other reason than I want to see the duopoly party stranglehold in Oklahoma broken. The Commissioner of Labor race is something of a mystery. Only Democratic candidate Fred Dorrell has anything resembling an idea of what they want to do in the office. For that reason, I am inclined to support him in the coming election. In the Insurance Commissioner race, we have a Republican career politician and a small business owning Democrat. Republican Glen Mulready has been in the legislature for over a decade and was part of the insurance committee. He says he has written many laws that impacted insurance in the state but I haven’t seen any indication that those laws have improved anything. I am not inclined to trust anyone making a career out of politics, especially someone who clearly telegraphed his intentions so early. So I will endorse Democrat Kimberly Fobbs. In the race for Corporation Commissioner, Incumbent Republican Bob Anthony doesn’t tell us much about what he plans to do, instead relying on his long history in that office. He has effectively made a career in this position. His Democratic opponent Ashley Nicole McCray has a plan that includes providing services such as high speed internet to rural Oklahoma, something that it is in desperate need of. She also wants to make sure that the citizens of Oklahoma are protected from the long history of carelessness on the part of major companies in the state. Ashley Nicole McCray has my recommendation. In the First Congressional race, we have Republican Kevin Hern and Democrat Tim Gilpin. I honestly don’t see a lot to like about either one. They are both pretty awful on a foreign policy perspective, but Hern’s terrible stance on immigration, one founded on many falsehoods about the Obama Presidency, makes him even worse. I don’t live in the district and if I did, I would likely hold my nose and vote for Tim Gilpin. In the Second Congressional race, we have a four way race. Incumbent Republican Markwayne Mullin is not right for Oklahoma. He needs to go. His Democratic Challenger, Jason Nichols actually seems to be pretty good on many issues. For example, I love that he supports Net Neutrality. I do not support the Libertarian in this race. He is not a good person in general and has made personal attacks and lies about many of my friends. The Independent in this race doesn’t have any plan to speak of. So vote for Jason Nichols. In the Third Congressional Race, I endorse Democrat Frankie Robbins. Republican Frank Lucas is a big government conservative and does everything he can to increase government spending. I don’t believe that Robbins will be much better in that regard, but he will at least push back on some of the worst Republican impulses in congress. In the Fourth Congressional Race, I never liked Republican Tom Cole. He is a war hawk and just loves to increase spending in government. The Independent in the race actually advertises himself as a MAGA Republican, ugh. Democrat Mary Brannon gets my endorsement for her stated goal to retire Tom Cole, Inhofe and Lankford. In the Fifth Congressional race, I highly recommend Democrat Kendra Horn. She is a solid choice and if any Democrat in Oklahoma has a shot, it is her. The 5th district has been trending Democrat for years and it is high time it flipped. Republican Steve Russell is a major spender in Congress, never seeing a spending increase he didn’t love despite his initial campaign against government spending increases. That needs to end. For all down ballot races, I won’t get into any specifics. There are too many to go through. So I will post my formula here. I have not met a single Libertarian running for Oklahoma Senate or House that I don’t like. So if there is a Libertarian running in your district, I highly suggest voting for them. After that, I tend to vote against incumbents. But I prioritize Democrats in races where there is no incumbent. For my local district, OK House District 81, I endorse Jackie Phillips. She has a good plan in place to represent Edmond in the capital. There are 5 state questions on the ballot this year. Here is how I am voting and how I recommend that you vote. Vote Yes on SQ 793, allowing optometrists to open up shop inside of a retail establishment. This will be good for competition. They only people against this proposal are those benefiting from the lack of cheap competition. Vote No on SQ 794. The Oklahoma Constitution already has a provision protecting victims’ rights. This question would put victim rights at odds with the right of the accused doing damage to due process in the state. Vote No on SQ 798. The office of Lt Governor needs to go. Combining its race with the Governor race makes no sense and opens up the potential for the legislature to use this change to harm new political parties. Vote No on SQ 800. The state does not need another rainy day fund, and they especially don’t need to create a new tax for a new one. Vote No on SQ 801. Pushing more of the funding for public schools onto property tax payers is a no go. It would create a very uneven funding mechanism for Oklahoma schools, punishing schools in low income areas and propping up high income schools. It has been a long time everyone. I have been working on a few things over the last few months, and I am finally ready to announce one of them. So here goes. Announcing the Simple Game Site Builder. This simple tool will help you get a clean and professional looking game site up and running in a matter of minutes. A couple of weeks ago, I read a great article by Justin Carroll about the need to have a clean and well structured site to sell your game. Inspired by this article, I set out to make an easy to use tool that will give you a great looking site to sell your game. All you have to do is update the included game_info.xml file, put your images into the images directory, upload everything to your web server and the site takes care of itself. There are some great features for this too. Use either a link to the location you are selling your game, or use the embed code from your store of choice. Include your trailer from whatever site is hosting it using their embed code. Display any number of images and features. Build a subscriber list for your company by including code from services like Mail Chimp. Point people to all your social media locations. We have also made the Simple Game Site Builder available to you under the MIT license for open source software. You can use and modify this code for any need you have. We have also made the code available on Github. If you want to contribute to the project, you can do so there. You can also see this tool in action over at the ManlyBoy site. What a year for an election. There is so much going on and so much at stake. So it is time for some endorsements from this Candidate for Congress. I will list my endorsements from the top down, first for those running on my local ballot and then in general for the rest of the state. First Up, I endorse Gary Johnson, Libertarian, for President. He is the only serious and qualified candidate running for the top office in the nation. He has executive experience as Governor of New Mexico. He has a proven track record of working with an opposing legislative branch. He has a proven record of smart budget policies. He has great ideas for our foreign relationships with other nations. In a serious election, he would be the top contender. While I don’t have any hope that he will win Oklahoma, I feel he has a great chance in the national race. But in Oklahoma, a vote for him means a vote for continued competition of ideas in Oklahoma. Next, I endorse Robert Murphy, Libertarian for Senate. I have known Robert for a while now and he is a really smart and liberty minded individual. He would make a great Senator and advocate for liberty, freedom and peace. I then endorse myself for Congressional District 5. Of course. For OK Senate District 41, I endorse Richard Prawdzienski. As a long time Libertarian, I trust Richard to make responsible decisions for the direction of this state. For OK House District 39, I endorse Clark Duffe. He is a respected friend and Libertarian. He will also help steer Oklahoma in the right direction. For Oklahoma County Clerk, I endorse Chris Powell, Libertarian. He has been a strong advocate for liberty and he will use his position to strengthen that in this county. For Oklahoma County Sheriff, I will abstain. Neither candidate is an honest or good person. They have both shown to be corrupt and untrustworthy. I can’t in good conscience vote for either one. For Oklahoma County Court Clerk, The incumbent lost in the Primary, but her Republican challenger does not possess much better judgement. I suggest voting for Anastasia Pittman for Court Clerk, but don’t make an endorsement. For Judicial Retention, I don’t have the time and energy to research the value of each judge’s rulings. Neither have I heard of any ruling that just made me shake my head as much as the legislation the state courts have overruled. However, any judges that are not retained will have final approval of Governor Fallin for their replacement. Fallin has not been a good Governor for our state and so she should be kept far from replacing any judges. Vote Yes on all judicial retention. For State Questions, see my previous post. In all other races, I suggest the following rules: 1) If there is a Libertarian on the ballot, vote for him or her. 2) If there is an Independent on the ballot, Vote for him or her. 3) If there is an incumbent on the ballot, vote for their opponent. SQ 776 – Adds The Death Penalty To The Oklahoma Constitution. This state question is a response by the legislature to recent court rulings against Oklahoma’s methods of executing people on death row. As a Libertarian, I am completely opposed to the death penalty. The US justice system is not perfect. Too often, innocent people, many of them with mental health problems, are railroaded through the justice system to secure a murder conviction. Prosecution and police use deceptive measures including coerced confessions and withholding and fabricating evidence to convict someone. People deserve every chance to prove their innocence, even if it take years or decades. The death penalty puts an irreversible roadblock to justice. I say we take a stand against the death penalty and Vote No on SQ 776. SQ 777 – Creates a “Right To Farm” Amendment to the Oklahoma Constitution. Farming is already a natural right of property owners. However, no one has a right to harm the property of their neighbors. One of the government’s primary purposes is to protect the rights of property owners from fraud and harm. I have heard no compelling reasons to support this Constitutional amendment, nor have I heard any compelling reasons for why this amendment is even needed. Until I see a compelling reason to enshrine such a “right” in the Constitution, I say Vote No on SQ 777. While this question sounds good on its face, it has a number of problems. First up, the supporters of this question are falling for their ages old “throw money at it” solution to failing education. They have done this before with taxes on gambling and other taxes before. But the real problem with our education system is bloat and a lack of competition. Public education supporters are afraid to take on these issues. Instead, they would rather increase the Oklahoma sales tax to one of the highest in the nation. Something that will drive people out of this state, reducing tax income. Vote No on SQ 779. SQ 780 reduces criminal penalties for a wide number of victimless crimes, including many drug possession charges. For years Oklahoma has been a “tough on crime” state. But in reality, Oklahoma has simply made sentences for minor offenses longer and harsher. This has not resulted in a reduced crime rate, but has only resulted in broken people and families. People who could have been a benefit to the state had they not had their lives ruined by time in jail and a criminal record. SQ 781 is a companion bill and can only have an effect if SQ 780 passes. It takes the money saved by not incarcerating those convicted of those minor offenses and puts those funds toward alternative reform programs. Both are great ideas. Vote Yes on SQ 780 and SQ 781. SQ 790 is a direct response to the ruling barring the use of public land to host the Ten Commandment Monument. Many Christian legislators were upset that the courts ruled that way. So they have responded with this question. However, they have not thought through the consequences of this measure. The First Amendment of the US Constitution is clear that government cannot create laws that benefit or harm a religion directly. By hosting the Ten Commandment monument, the OK Government would be propping up Christianity over other religions in this state. No one really believes that the OK Government would allow an Islamic, Jewish, Hindu or other religious monument on State property. This amendment would also open the doors to other means of directly financing religious institutions. Vote No on SQ 790. Oklahoma is still a state deeply in a prohibitionist mind set. While not as bad as other states, Oklahoma still heavily restricts the sales of alcohol. This question opens up production, distribution and sales of alcohol. Retail outlets will be allowed to sell wine and strong beer. Liquor stores will be allowed to sell more than just alcohol. Wineries would be allowed to ship directly to customers. And many more changes. These changes, while not where they could be, greatly frees up restrictions on businesses in this state. Vote Yes on SQ 792. Over the last few days, I have seen a lot of commentary about the nature of black communities in the US. Many of these comments are about how it is the black community’s responsibility to clean up their own problems. These comments blame the black community for the crime and poverty they experience and say that it is their sole responsibility to fix these problems. This is a bunch of crap. The problems they experience are primarily the result of US law and criminal policy. The problems these communities face are the result of politicians who have held racist opinions and agendas for decades. Let’s start with the biggest problem, the War on Drugs. Nearly every law and policy that has sprung from this ill fated war has a disproportionate impact on black communities. The excessive jail time those convicted of even the smallest possession infraction puts young people out of the education and workforce for years or decades. We lock up 20-something young men for 5-20 years, taking away their opportunity to build viable and employable job skills and education. We kick them out of prison at the end of their terms with no social support structure to help them readjust to life outside prison walls. On top of this problem, we enact laws that prevent convicted felons from being employed in many decent jobs. Many of these people are forced to take low wage jobs, and often under the table jobs, just to make even a modicum of a living. With such low job prospects is it really any wonder why they might consider a return to a life of crime where the money is better than the legal options available to them? Then we have the fact that too many jobs require licenses to even begin working. These licenses are often completely out of reach for anyone with a felony background. For those without such a background, the time and cost of gaining such licenses is often out of reach. These licenses mean that those in poor communities often cannot seek employment options that would actually provide them a real living wage because they cannot afford to take the time and spend the money necessary to get them. Then we have strict zoning laws that make the cost of starting a new business even higher. Instead of allowing entrepreneurs the chance to build their business out of their homes, we instead force them to spend money they likely don’t have on rent for commercial business space. Next up, we have our terrible public education system. This system is designed, not to educate our children, but to enrich a handful of administrators and build up a bureaucracy that keeps bad teachers in jobs and pays wages low enough to keep good teachers away. Instead of instituting policy changes that will bring real education to our poor communities, those in government do everything in their power to keep our terrible system in place. Is it any wonder why the kids in these terrible schools can’t get the education needed to build a better life? With all this in mind, many people in power demand that these poor minority communities fix their own problems. They say “You should vote to enact change” but then weaken their voting power through political tricks. Gerrymandering is the process of drawing legislative districts strategically. They draw these lines not to give communities proper representation, but to give those people already elected the best chance to be reelected. District lines are often drawn in such a way that they break up minority populations and split them into smaller parts of populations more favorable to incumbent politicians. This means that the people who live in these communities can’t band together to enact change because we artificially break them apart. Despite knowing full well of all these problems, the Republicans and Democrats in power have no interest in fixing them. The fact that these problems exist means that Republicans and Democrats can continue to hold onto power. Republicans know that with drug laws and felony backgrounds, the financial power of minority communities will never reach a point where they can influence people in power. They can enact stricter drug and crime laws to keep more and more people out of the work force and keep them in poverty. Democrats know that by expanding welfare systems, they can claim to be helping these communities but in fact are simply building up a dependency on the government for their continued survival. If we really want to be rid of the criminal elements in these communities and to bring these people out of poverty, then we need to get rid of these laws, regulations and policies the entrench poverty and crime in these areas. We need to end the drug war and stop locking people in prison for victimless crimes. We need to put an end to all mandatory minimums. We need to end laws that prevent people with criminal backgrounds from getting good jobs or starting their own businesses. We need to bring about real education reform in the form of competition in education. Let these people choose the school they want to send their children to. We need to end licensing schemes that do nothing but lockout these people from gainful employment. We need to end gerrymandering and other election laws that weaken the voting power of these communities. If we removed these barriers to improving the lives of our poorer communities, they will require fewer welfare programs and can actually build and improve their own lives and communities. That is what I want to do as your elected Congressman. I want to get government out of your way and give you the freedom to live your own lives how you see fit. If these changes are made, you will have fewer interactions with police, less crime in your communities, and better economic and civic options open to you. This past weekend, a horrible tragedy occurred. A shooter in Orlando, Florida targeted a nightclub which caters to the LGBT community. The shooter entered this nightclub and killed 49 innocent people and wounded many more. This shooter will not have to face the people and their families as he was killed by officers on the scene. I express my sincere sorrow for this tragedy and my sympathies for those killed or harmed and their loved ones. No one should have to go through the pain they have experienced and will continue to experience as they deal with the fallout of this heinous action. It is times of tragedy, such as this, that many politicians seeks to push their personal political agendas. On the side of Democrats, they have already started pushing their anti-second amendment agenda. On the side of Republicans, they have already begun their push to further expand the war on terror and its expansion of anti-fourth amendment agenda as well as their vilification of all people of Islamic faith. But times of tragedy and emotion are not the time to make policy changes. It is times of tragedy and high emotion that politicians are willing and capable to pass laws that violate our basic human rights and drive the US deeper into damaging domestic and foreign polices. It was in a time of high emotion that lead the US to invade and destabilize Iraq. It was a time of high emotion that led to the US passing the PATRIOT Act, one of the largest violation of our constitutionally protected rights. It was a time of high emotion that led the US to develop and drop atomic weaponry on innocent people in Japan as well as imprison innocent Japanese Americans and immigrants. Humans make poor decisions when emotion is the driving force behind them. That is why I vow to not make rash decisions during times of tragedy. We need to let our heads cool before we respond to tragedy via legislation. We need to use facts and real world data as a basis for policy changes, not high emotions. It is why in this time of tragedy and high emotion that I make this promise. This past week, Governor Gary Johnson, the Libertarian nominee for President, was criticized for saying that he agreed with Bernie Sanders on “73% of the issues”. 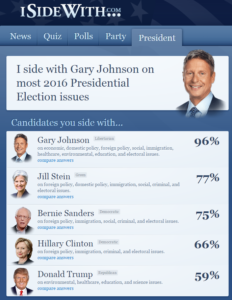 In these reports, Governor Johnson cites the popular political quiz site ISideWith.com. This site asks you a series of questions and then uses your responses to tell you how your answers compare to popular Presidential candidates. I decided to take a look at the site and do a little experiment of my own. ISideWith can tell you multiple things, depending on how you answer your questions. ISideWith asks a series of questions, but not all of the questions are viewable without clicking a link. The same is true with the answers. Each question has two default answers “Yes” or “No” or some variant of that. However, most of the questions have multiple expanded answers. With all this in mind, I decided to take the test four times. Here are the results of each of those tests. My first time through, I answered only the default questions using only the default answers. As you can see, based on these results I side with Governor Johnson on 91% of the issues. I also side with Clinton on 79% of the issues, Stein on 78%, Sanders on 77%, and Trump on 63%. My second time through, I answered all the expanded questions using only the default answers. This time through, my score with Johnson improves while every other candidate drops with the most dramatic drop being Clinton by 11 percentage points. My third time through, I answered only the default questions but I used the expanded answers where they applied. My overlap with Governor Johnson actually falls a bit, but he is still my #1 guy. Trump drops considerably. Hillary improves a bit, but her placement remains the same. My final time through, I answered all the expanded questions using expanded responses when applicable. Governor Johnson springs back up to his second highest overlap with me. Everyone else stays stays about the same. Update: I took the Quiz a 5th time and actually weighted my responses. This changed things considerably. Here my alignment with Trump falls considerably and Bernie jumps up a percentage point above Stein. If we average all four five scores of each candidate, these are the results. I side with Governor Johnson 91.25% 91.2% of the time. I side with Stein 77.25% 75.8% of the time. I side with Sanders 75.25% 74.6% of the time. I side with Clinton 70.5% 68.4% of the time. Finally, I side with Trump 57.75% 54% of the time. What all this tells me is that my political views are more liberal than they are conservative. What is the point of all this? Nothing much. I think that ISideWith is a fun exercise in political science, but it is not an exact science. Part of the problem is that the quiz doesn’t include a lot of questions that many of these candidates find important. Additionally, some questions don’t have answers that reflect all possible positions of these candidates. So while this quiz is fun, I wouldn’t recommend using it as your only guide in the election. Nor would I recommend using these results to attack or insult any candidates or voters. If you are interested in taking fun political quizzes, I also recommend taking the World’s Smallest Political Quiz to find out where you fall on the political spectrum. This weekend is the Libertarian Party National Convention. At this event, delegates from around the US will convene and nominate our candidates for President and Vice President. There are a lot of people running for the LP nomination for President and Vice President, but I feel there is only one ticket that makes sense for the growth and strength of this party. There are currently three front runners for President. Each one has picked their preferred running mate. They all bring something interesting to the table and express some good and some bad elements to the table. Out of all these candidates, there is only one ticket that I feel works best for the LP and the US. That ticket is former New Mexico Governor Gary Johnson and his chosen running mate, former Massachusetts Governor William Weld. Why these two? Because they bring something no other candidate for the LP nominations have, experience and name recognition. Both of these men are successful Republican governors who served with Democratic controlled legislatures. Even with the law writers stacked against them, they managed to cut taxes, the size of government and overall spending. They managed to do the impossible, work peacefully and compromise with political opponents to pass liberty expanding laws in their respective states. Are they perfect Libertarians? Absolutely not. Neither am I and neither are you. They made mistakes and hold some opinions that many Libertarians have a hard time swallowing. Both Gary Johnson and William Weld have done and said things in the past that I don’t agree with. However, they have both apologized for and explained their decisions and how they have changed. That to me shows wisdom and strength. Things that can only come from real experience in a political landscape. I feel that people can change as they are given new information. I feel that Johnson and Weld have done that and continue to do it. That is the important thing. I don’t think I can ever trust someone that claims to be a perfect Libertarian. They also bring name recognition. Both are successful two term Governors. Gary Johnson ran as the LP nominee in 2012. This experience has already led to Johnson being included in several national polls, something that no other LP candidate can claim. These polls show Johnson already polling in the double digits against the presumed Republican and Democratic nominees. This polling is incredibly necessary for a serious LP ticket. Without the ability to poll well, the LP will not have a chance this election. The Presidential Debates, run by the R and D controlled Commission on Presidential Debates, are an important part of running for President. If the LP nominee does not get into those debates, there is no chance that we will actually make a difference this year. With Johnson already polling just a few points away from the 15% requirement by the CPD, they have a chance to get in those debates and spread our message. It is with all this, that I feel we will have the best chance of reaching out to disenchanted Democratic and Republican voters who want anyone else besides Trump and Clinton. With the insanity on display by the Republican and Democratic parties, a breath of fresh air and seriousness is the only way to compete. There is no way we can out crazy those two and expect to make a difference. We have to compete on experience and leadership. Taking all this into account, Johnson/Weld is the only ticket I see that results in the most successful LP run for President to date. Honestly, I have no aspirations to a Libertarian being elected to President this year. However, if that were to happen, it will only be with a Johnson/Weld ticket. It is no question that money is a big part of politics. Those that win Congressional seats often raise and spend several hundreds of thousands of dollars to secure their seat. Some, like my opponent Steve Russell, even go into debt to do it. 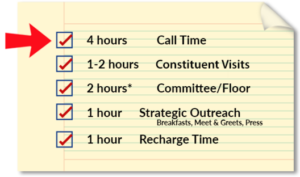 But did you know that members of Congress are pressured to spend a sizeable amount of time cold calling for campaign donations? Even while they are supposed to be writing and learning about bills that will be coming to a vote? 60 Minutes did an expose about this practice and CBS had an interview with Congressman David Jolly who wants to put a stop to this practice. He has introduced a bill called the STOP Act, which would make it illegal for elected officials to ask for money while Congress is in session. watch his interview below. I support this bill. If elected, my job will be to learn about the issues that impact Americans, learn about the bills my colleagues have introduced, and to write bills that will advance freedom and peace in the US. My job is not to campaign for the next election or to raise money for a political party. If elected, I will support this bill, or one like it. If one is not introduced, I will introduce it myself. Congress needs to get off the phones and get back to work. You can tell Congress to do its job by signing Rep. Jolly’s STOP Act petition. On March 21, 2016, the Oklahoma Election Board announced the Libertarian Party is now an officially recognized party in Oklahoma. It had been 16 years since that was the case. In the years between, Oklahoma has had only two Presidential candidates and two parties available for Oklahoma voters. This is a horrible injustice to the people of Oklahoma.